The Braun Series 3 340s-4 promises close and smooth shaves without spending a premium price on the shaver itself and on replacement parts. Without the bells and whistles of more expensive razors, the 340s-4 is an excellent choice if you’re looking for a quality, reliable and inexpensive shaver. However, as all electric shavers out there, the Series 3 340-s has its pros and cons and there are also quite a few compelling alternatives out there. Read along for our full review to get all the details that matter. The Series 3 is Braun’s budget line of electric shavers that supposedly strike a great balance between cost and performance. The Braun Series 3 340s-4 belongs to the first group and it is almost identical to the 380s-4 that we previously reviewed and turned out to be a really good razor. There are a couple of differences between them that we’ll get to later on in the review. Let’s take a closer look at the first two as the rest are pretty self-explanatory. SensoFoil is the name that Braun uses for its screen foils. While the typical foil features simple, round perforations, Braun opted for different ones. The irregular shape supposedly catches the hairs that grow in different directions more efficiently and is also more gentle to the skin. While we can’t really say if it makes a difference when compared to a regular one, the design seems to make sense; you can see it in action here. The shaver features 3 cutting elements that move independently. 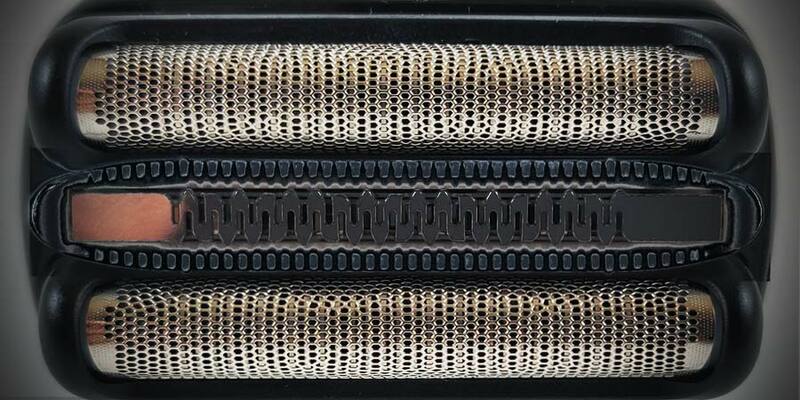 The outer ones are the perforated SensoFoil screens responsible for the grunt of the shaving, while the middle one is a specially designed trimmer that can handle longer hairs. You can also see the cutting system in action in this video. I’ve been pretty happy with the build quality of the shavers that Braun produced over the last few years. The best part is that even with the budget-friendly Series 3 you’ll still get a robust and well built razor. Of course, it won’t have the high-end finish and looks of a Series 7, but it is still superior to other shavers in this price range. The 340s-4 has a typical Braun design, with glossy plastic on the front and rubbery surfaces on the sides for a secure grip. It is very light and comfortable to hold and operate and has a reassuring sturdy, robust feel to it. Even if the profile is rather chunky and doesn’t taper at all, the grip is still very secure. With only 3 blades, the shaving head is also very slim and nimble and it’s extremely easy to use, making it ideal for a beginner as well. In order to keep the price low, Braun didn’t include a travel case. With a fully charged battery, you will get 45 minutes or approximately two weeks of cordless shaving. These are pretty much the standard numbers for a quality electric razor with a Ni-MH battery. The LED on the front of the shaver will flash red when the battery is running low on power. Charging takes about an hour and you can plug the cord directly into the shaver or use the included plastic stand. Since this is a wet/dry shaver, you can’t use it while it is plugged in as a safety precaution. You do have a quick charge option though that will provide enough power for one complete shave. The Series 3 340s-4 also features automatic worldwide voltage adjustment and it adapts to any voltage between 100-240v. Since it is fully waterproof, the shaver can be easily rinsed under running tap water. For a more thorough cleaning, it is recommended to use some liquid hand soap. After that, you just turn it off, remove the cutter block and let it dry. Braun also included a cleaning brush in the box, so that can also be used, but only for the inner area of the cassette. It is not recommended to be used on the foil as it can be easily damaged. The folks at Braun were thoughtful enough to also include a bottle of fine machine oil. As part of a long term maintenance plan, you should use it every once in a while to lubricate the blades; this will minimize the friction and wear of the replacement parts and will make them last longer. 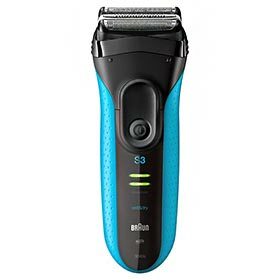 I will say right of the bat that the Braun Series 3 340s-4 is a very decent budget shaver when it comes to shaving performance and would be an excellent choice for most men. It is just powerful enough for heavier beards and it is especially good when used for daily shaving. It gives a close and smooth shave, without causing irritations, razor burn or any discomfort. Using it with a shaving gel or cream can improve the comfort and performance, but you’ll have to try that for yourself to see if it’s worth the extra work. The specially designed foil and central trimmer cope pretty well with cutting stray hairs, especially on the neck. It’s still not as good as a more expensive Series 5 or 7, but for a basic foil razor, it’s not too bad at all. The popup trimmer is worth mentioning also, as it’s pretty useful for some light grooming and touchups. The size and positioning are spot on, but it’s not as sharp and precise as the one on a Panasonic Arc 3 for example. 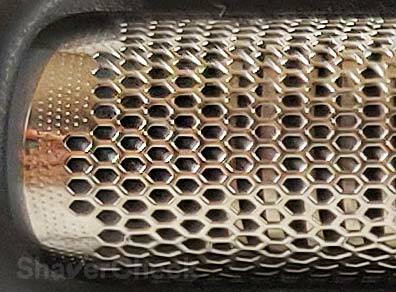 The shaver is not exactly quiet during use, emitting a raspy buzz and vibrating quite a lot. But then again, all foil electric razors are pretty loud, so I can’t really blame the 340s for it. Now lets get to the not so good parts. As previously said, this shaver is especially good when used for daily shaving or even every other day. If that sounds like you, the 340s-4 will be more than enough. If however you have a very coarse beard and shave every two to three days I would suggest taking a look at a more advanced shaver (like the Braun Series 5). While the 340s-4 is quite capable, your shaving experience won’t be that good as you may experience some pulling and of course, the closeness of the shave will suffer. Also, while the closeness is satisfactory, a Panasonic Arc 3 will probably provide a closer shave, even though it won’t be quite as comfortable as a Series 3. The Braun Series 3 340s-4 is a very smart choice when it comes to maintenance costs. In order to get the same quality shaves, the shaving block must be replaced periodically. While most manufacturers recommend changing them every year, the replacement parts from Braun last at least 18 months and are inexpensive. Another bonus is that you only have to change the shaving block, so you’re not spending extra money on both foil and cutters like you would do for a Panasonic shaver. When the shaving head needs to be replaced, an LED light will notify you; it can be reset by pressing the ON/OFF switch for five seconds. The 340s-4 is a very smart choice for multiple reasons: it provides adequately close and irritation free shaves, it’s inexpensive to buy and to own, it’s well built and is an overall excellent product. Apart from the situations mentioned in the performance section of the review, almost anyone will be satisfied with it, especially men who shave daily or up to two days. Regardless if you’re a long time user of electric shavers or just starting out, you really can’t go wrong with this shaver if you’re looking for a budget-friendly product. If however you’re looking for the closest and fastest shave you can get, you will definitely have to look at a more expensive shaver. An obvious alternative is the Braun Series 3 380s-4. Like I said at the beginning of the review, the 340s-4 is almost identical to the excellent 380s-4 that was reviewed previously (read it here). When compared side by side, there is only one difference between them: the 340s-4 doesn’t have a lock switch for the shaving elements. From my experience, I will say that this locking feature will be beneficial for very few people if at all. You could use it when shaving tricky areas like above the upper lip or around a goatee, but it won’t make a big difference. Another thing worth mentioning is that unlike the 380s-4, the 340s-4 doesn’t come with a travel case. Again, this won’t be a deal breaker for most of us. Apart from the points mentioned above, there is absolutely no difference between them, they use the same shaving block and the performance will be the same. If you want the travel case and the ability to lock the cutters in place, go for the 380s-4. If you don’t think they’re necessary (I personally don’t), then save some money and buy the 340s-4. Finally, by now both the 340s-4 and the 380s-4 are discontinued and very difficult to find. Moreover, the price can be inexplicably high for such an electric shaver. With that said, the best alternative would now be a shaver from the new Series 3 ProSkin line like the 3040s. Performance-wise, it is extremely similar to the 340s-4 review here, but it is widely available and reasonably priced. And we also have the Panasonic Arc 3, which is again another excellent option in the entry-level range. While not as comfortable to sensitive skin as the Series 3, it is very fast and shaves extremely close. For more details, check out my review of it here. If you bought one of the Series 3 shavers that are suitable for wet & dry shaving (like the 340s in this review, or the newer 3040s that I reviewed here), then you can definitely use it with a shaving cream or foam. If you choose to do so, I highly recommend going for a quality shaving cream and not the canned stuff. I wrote an extensive article about this topic here, I highly recommend checking it out. Ovidiu, I am experiencing a strange problem with my Braun 340s-4, which I bought just over a year ago. The battery status lights are working fine; however, immediately after charging (whether a quick charge or the full hour) the green light starts flashing very rapidly and the shaver won’t switch on. This situation continues for about two full days, then the green light stops flashing and the shaver works perfectly again. The shaver is great except for this. Are you able to advise me on what is going on? I live in South Africa, so don’t have easy access to a shaver repair shop. from your comment I can only assume that your razor has a hardware problem, maybe something related to the battery’s overcharging protection mechanism since this only happens after you charge it. Unfortunately there’s not much you can do in this situation. Since the razor was bought one year ago, it should still be covered by the standard 2 year warranty. In this case I suggest contacting Braun’s Service Partner in South Africa here. If that’s not an option, you could also continue using the razor if this situation is acceptable and doesn’t interfere with your normal shaving routine. Another option would be to simply buy a new one. If you decide to do so, then definitely consider the 3040s, the updated version of the 340s-4, as it can be found at massive discounts, sometimes costing as low as $35. It’s identical in terms of performance and even uses the same shaving head. I’m ashamed that I did not acknowledge or thank you earlier for your clear and thoughtful reply to me. I’ve taken your advice and learned to manage the problem. I suspect you are right that there’s a fault with the overcharging protection mechanism. I’ve been timing the recharges and keeping them to 45 mins. This usually works, though I of course have to recharge more often (not a significant problem). Once I knew about the likely cause, thanks to your advice, I could adjust my expectations. Thank you for providing such help to the user community. No problem at all, I’m glad to know that you managed to solve the problem. Thank you for the kind words. I have bought a new head for my Braun shaver series 3 but all the lights turn red and then the light show to replace the head. Not sure what is going on can you help. Try to reset the counter by pressing and holding the ON/OFF switch for at least 5 seconds. The replacement light should go off once the reset is complete. I have the 340s-4 and have been mostly satisfied. I agree with the daily shave versus every 2-3 days; definitely much harder with this razor when not using daily. A question I can’t find anywhere else: will these ‘s’ models that don’t come with a cleaning station work with a Series 3 cleaning station? I bought clean & renew cartridges not realizing I need a cleaning station, and now I’m trying to decide if it’s worth it to get a cleaning station for it… obviously not if 340s won’t clean (let alone charge) in a cleaning station that come with the 340cc models. Otherwise I may just return the cartridge refills. Thanks for any tips/advice you have! unfortunately the answer is no, the s models won’t work with the cleaning station because they lack a dedicated chip used to communicate with the station. In this situation it would be best to simply return the cartridges. I have a Braun Series 3 304s-4 and the Charger and Stand were lost during a recent move. I can not seem to find a Replacement for it. Is this Razor considered to old to have replacement parts? If not what do you recommend. Thank you in advance for your help with this issue. You should still be able to find a compatible charger. Check out Braun’s listing on Encompass at this link, they have pretty much all the parts you could ever need. I have a Braun Series 3 3040s electric shaver. In the booklet that I got with the shaver it tells me that when the battery is running low the red low-charge light flashes. I have used the shaver for a week now but the red low-charge light doesn’t flash. How long will it be before the red low-charge light flashes. That really depends on how often you shave and how long it takes you to complete a shave. For example, in the case of a light beard and shaving every two days or so this can take in excess of two weeks. But it will eventually get there. I wouldn’t worry too much about it. I am wondering if I can use my Series 3 340 to shave my chest. If not, can you suggest another Braun model that could do the job? You can an electric razor to shave your chest, but keep in mind that it can only be used efficiently on very short hair. So you’ll absolutely have to use a trimmer beforehand to reduce the hair to a more manageable length and then shave it close to the skin with an electric razor. The 340s is a decent shaver and will get the job done, even though something more powerful like a Series 5 would be faster. This is without doubt the best so far shaver I’ve ever had; I have been electric shaving user for last 31 years and in my time I have had very good shavers (most of them dry shavers); few Philips dry rotary shavers, Remington foil and rotary dry shavers and one Sanyo dry/wet foil shaver; all of them were rechargeable shavers for convenience, normally I dry shave (using pre-electric lotion before shaving) but sometimes I get wet shave with the Braun 340s-4 foil shaver and strictly I have followed the rules of cleaning, lubricating and charging the shavers which paid off as all of them served me not less than 5 years plus of good shaving (except when by accident I have dropped the shaver and it got broken) otherwise I had a Braun dry foil shaver that lasted me 9 years with just one change of cutter and foil until the battery didn’t hold the charge any more and I had to replace it for a Philips rotary dry shaver which lasted 8 and half years without changing the cutters at all until by accident I dropped the shaver and it broke when it hit the floor; looking after the saver will keep it in perfect working condition for you to have a close, clean and smooth shave for many, many years and this is guaranteed. Thank you for taking the time to share your experience with this shaver, Edinson. I really appreciate it.